The sunshine of the last few days brought some much appreciated warmer temperatures for the weekend. In true March fashion, the breeze blew enough to remind you it's not quite spring yet, but we enjoyed the sunshine and relative warmth of this first March weekend. 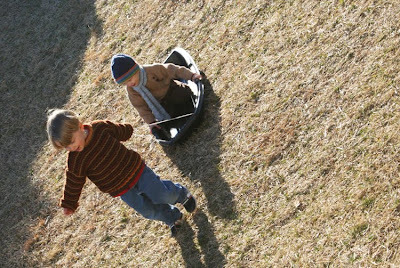 Finn still hasn't quite let go of the fun of the snow, but pulling his friend around in the sled did make for a very cute photo op. I was on call for work the whole weekend, and the pager was busier than usual. We weren't able to get into many crafts, but Finn and I decided to make koolaid play dough this weekend. Not exactly natural with all that artificial color and flavor, but it was fun to sniff while we played. 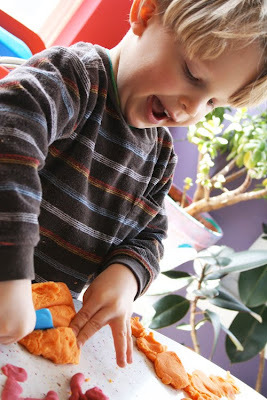 Finn chose some spring-y colors and had such a wonderful time making everything from pretzels to snails to cars. I'm often glad during times like this that he has my attention to himself every other weekend to work on these crafts that are more age appropriate for him. When Elizabeth came home, she and Finn spent most of the afternoon outside in the sunshine. 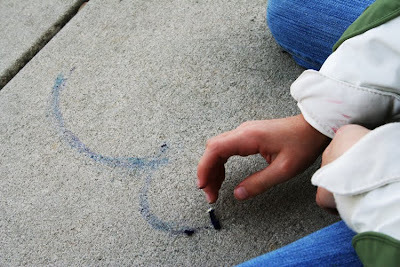 They painted on the sidewalk with pansy petals. And we went for a lovely walk through the neighborhood. 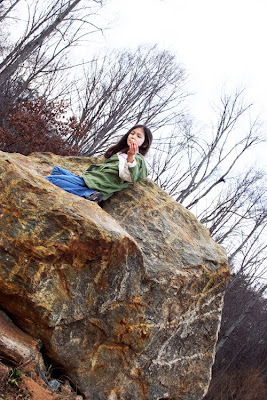 Until Elizabeth discovered the kids' favorite climbing rock...which gave her an idea. 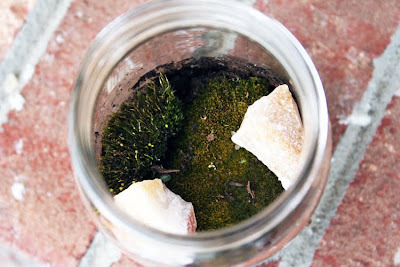 And we started an observation jar with 2 different kinds of moss and a few of the rocks Elizabeth collected. 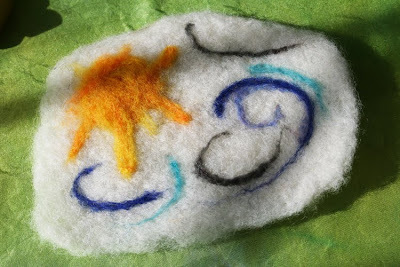 What simple, yet delightful, ways to experience a few snippets of spring on this lovely first weekend of March! Looks like fun was had by all! I'm planning to live outdoors all week until the rain comes back! I want to make some kool-aid play dough! Thanks for the link to the recipe. I know it's not the healthiest stuff, but I love the smell! I think koolaid playdoh is on my list-my kiddos would love it at work! Isn't it nice to have that sun out? 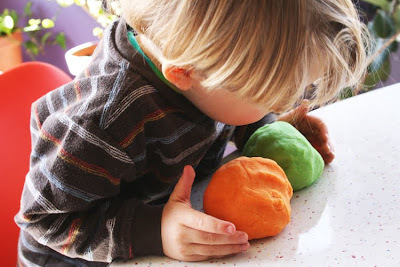 Homemade playdough is the best! Zach still gets hours of fun out the batches we make. And I love the moss garden. That's something I have been meaning to so with Z for a while. I think we'll have to make some observation jars too! Funny, I go back and forth from making homemade play dough, to deciding (after picking the dried bits off the floor) that I will never make it again. Thanks for sharing your weekend! how sweet! my finn is loving play dough, too! 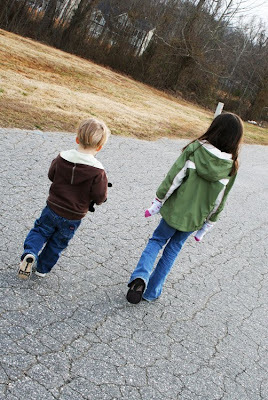 and the photo of finn and elizabeth walking together is super sweet. wonderful weekend! Love it all, esp. the wool at the top. I love it all! 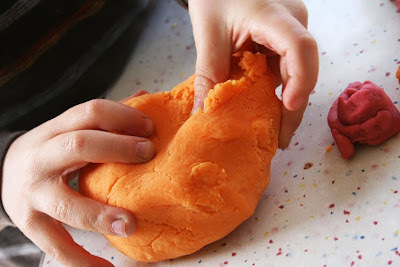 We've made this (in-organic) playdough before too. although, yours doesn't look as sticky as ours...& the mosses are so beautiful! I hope you can enjoy watching the jar for a long time!